Yes,I know it's been quite a while since I last posted anything, but trust me, it's not because there hasn't been anything going on. Of the positive events that have transpired, you should know I've released a new book (see sidebar). It took some time to complete. And yes, yes, yes, there's lots more horse stuff in that one -- and I know for a fact that's what a bunch of you Thea Campbell fans want! My friend Kate Wyland nudged me into action by asking me to contribute to her wonderful blog "Conversations with Horses and Others". And, of course, when a friend asks what can you say but "when do you want it?" So, without further ado, please, click on the link below to Kate's place and read "The Art of Breathing for Two" -- it's about how sport transcends the technical and become an expression of the heart. And say "hi" while you're there! You're right. This is not a horse. 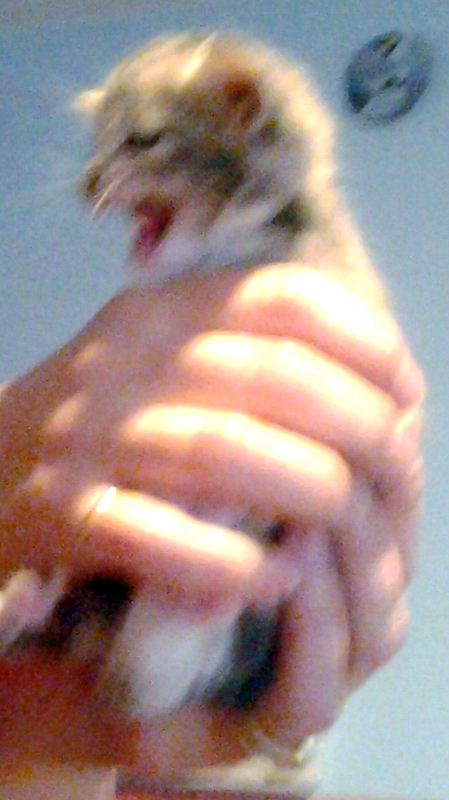 It's a tiny, cute, kitten that will keep screaming until you click on the above link to Kate's blog! How can you converse with horses? that's crazy! My horse got a Reithelm to speak to me.